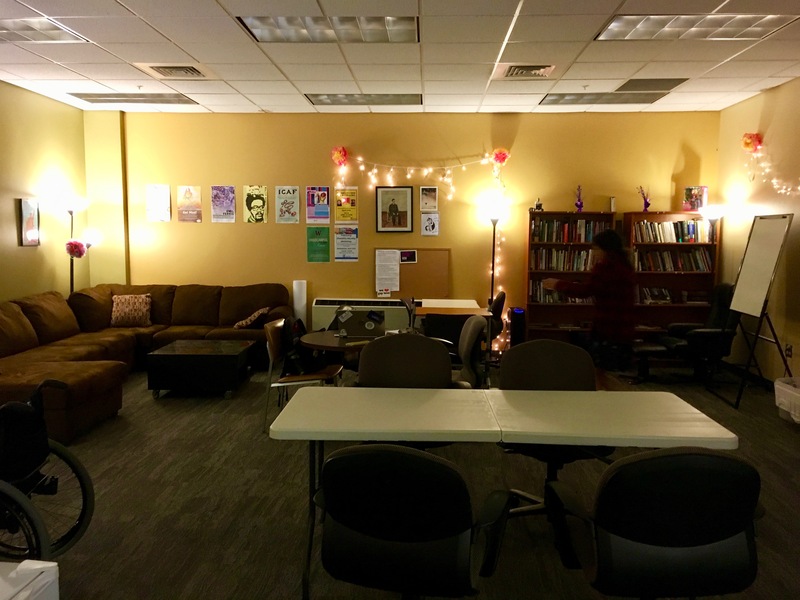 The D Center is UW’s Disability and d/Deaf Cultural center, housed in a cozy space in Mary Gates Hall where students can study, organize, rest, or hang out with classmates and other community members. Throughout the year we host events and workshops focusing on social justice and activism. Our space is accessible to mobility aids, low lights, and scent free. A wide view of the D Center in MGH 024, warmly lit with posters and fairy lights strung on the wall. To left is a brown sectional couch, in the center are meeting tables with chairs, and to the right are two bookcases filled with books and games. We are located in Mary Gates Hall at the lowest level, Room 024. To find the D Center, enter the front entrance of Mary Gates Hall and take the stairs or elevator on your left. If there are any questions, concerns or suggestions you have, please feel free to let us know at dcenter@uw.edu. Thank you for visiting our website!